April 28, 2017 at 12:00a.m. Neighbors | Abby Slanker.Two Hilltop Elementary School first-grade students enjoyed browsing through the variety of books available at the school’s annual book fair with the theme “S’more Fun with Books!” on March 16. Neighbors | Abby Slanker.After choosing a book, a Hilltop Elementary School first-grade student checked out the ‘campfire’ in the library during the school’s annual book fair with the theme “S’more Fun with Books!” on March 16. Neighbors | Abby Slanker.Hilltop Elementary School’s library was transformed into a camper’s delight for the school’s annual book fair with the theme “S’more Fun with Books!” on March 16. 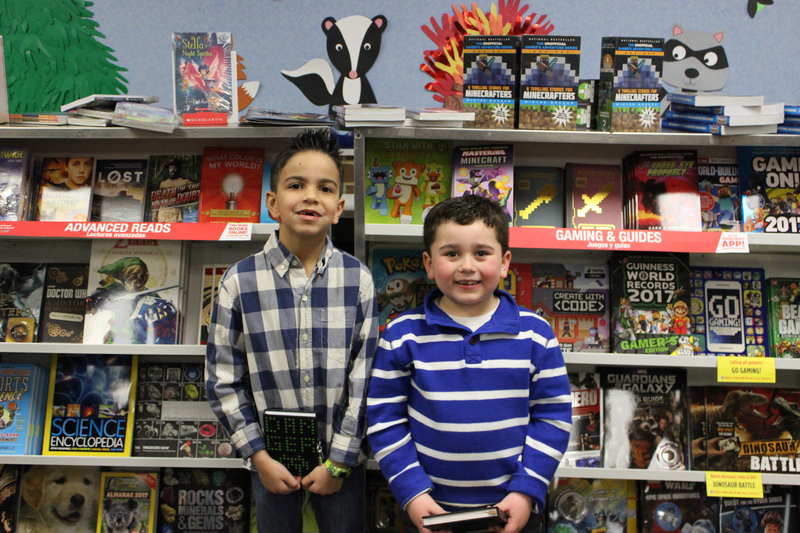 Students at Hilltop Elementary School were happy campers during the school’s annual book fair March 13-17. With the theme of “S’more Fun with Books!,” the library was decorated with trees, lanterns, woodland creatures and even a camp fire. The students attended the book fair during their scheduled library times. The students also visited the book fair the week before they were scheduled to shop so they could browse and create a wish list of books they wanted to buy. Students could also attend the book fair during the school’s K.I.S.S. evening event, during which Kids Invite Someone Special, to look over the book collection and make pre-sale purchases on March 13. Outback Ray joined the students and their families for the event and brought along a variety of exotic animals for the students to see and hold. The book fair was organized by Patti Hockensmith, Hilltop Elementary School and C.H. Campbell Elementary School librarian/media specialist. A variety of books of all reading levels were available for the children to choose from, including chapter books, picture books, “Star Wars,” reference books, cookbooks, bestsellers, science and creative fun. Parents and grandparents were also invited to the days of the book fair to help the students shop. The book fair also offered adult bestsellers for the parents and grandparents who attended the fair. Students could also purchase posters, bookmarks, pencils, novelty erasers, journals, pens, stickers and more. Each teacher was able to select books they would like their classroom to use, and students were able to purchase the books for the classroom. Members of the school’s PTO helped set up the book fair, operated the checkout during the fair and were also available to help the children pick out books. Hockensmith stated proceeds from the book fair are used to buy books and other items for the library.